» What is the Best Dry Cat Food? While wet food is the closest you can get to a cat’s natural diet, there are many reasons people choose to feed their cat solely on a diet of dry cat food. If you’re one of those people, it’s vital to get the choice right to ensure your cat stays healthy. You want one that’s nutritional and tastes great. Whether you prefer to feed your cat something non-grain, organic, or just simple and tasty, there is something on the market that fits your needs. Here are a few of the top options for dry cat food – they offer more than just your standard fare – and come recommended by our expert panel of humans and kitties. Purina Beyond features only the very best ingredients in their dry biscuits and none of the other harmful fillers that can be found in pet food. 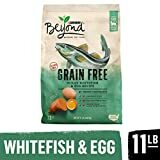 The main product this range is ocean whitefish, and along with other nutritious ingredients, it provides a grain free and protein rich food choice. Celebrity chef Rachael Ray has launched her own line of pet food, with the Nutrish dry cat food biscuits being a huge hit. Using only real chicken as the main ingredient and no by-products or fillers, you can be sure of exactly what you’re getting with this dry cat food range. Known for being a favorite among pet owners, Meow Mix Original Choice Dry Cat Food is a popular choice for dry food. This food features all of the essential minerals and vitamins that your pet needs in delicious flavors that every cat is sure to love. 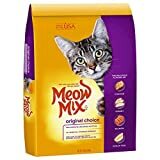 Each of these favorites seems to tick all of the boxes, but in our view, Purina Beyond has everything you could ever need for peace of mind that your cat is getting the very best, and it’s something that your pet will enjoy too. With no grains, there’s never a need to worry about upsetting your cat’s digestion, and a guarantee of no added artificial colors, flavors, or fillers means you know exactly what you’re putting into that bowl. Purina Beyond is an affordable way to give your cat the very best nutrition in dry form.